Russia’s “List of Terrorists and Extremists” keeps growing. Moscow has recently labeled the Crimean Tatar Suleiman Kadyrov as an “extremist” after he published on social media that “Crimea is Ukraine” – an act that supposedly challenged Russia’s territorial integrity. Supporters of Mr Kadyrov have contested the trial procedures, underlying that he didn’t benefit the presumption of innocence and that he cannot be deprived from his pension. Suleiman Kadyrov risks a 5-year imprisonment. Suleiman Kadyrov has become the latest Ukrainian to be added to Russia’s ‘List of Terrorists and Extremists’ for openly calling Crimea part of Ukraine. The 54-year-old retired policeman faces a 5-year prison sentence for what Russia is calling ‘public calls to activities aimed at violating Russia’s territorial integrity’. As with analogous prosecutions, Russia has ignored the presumption of innocence and labelled Kadyrov an ‘extremist’, with this meaning that his bank accounts are frozen and he cannot receive his pension. The civic activist and member of the Feodosia Mejlis, or self-governing body, explained to Krym.Realii that the criminal proceedings against him are over a post on a social network “Crimea is Ukraine”. There were no grounds for blocking his pension which is his sole income and needed to look after a family of four, including his 10-year-old daughter and elderly mother. “How can you deprive a person of the pension which is guaranteed not only by international law, but by Russia’s own Constitution? These are social benefits, they have no right to block them”, he stresses. As reported, armed men turned up at Kadyrov’s home on October 5, 2016 and carried out a search, lasting around 3 hours. He stated immediately that he would not give any testimony or explanations, nor would he sign their search protocol, since his rights were being violated. He asked to have his lawyer present, and witnesses he chose, but the officers insisted on using the ‘witnesses’ they brought. The search took around 3 hours and the armed FSB officers took away his computer and telephone. The warrant, it later transpired, was issued by judge Igor Rodionov over alleged public calls to deny ‘the borders of the Russian Federation’ and support the Crimean Tatar Asker Battalion. Lawyer Emil Kurbedinov, who is representing Kadyrov, reported on Oct 11 that Kadyrov had still not been provided with a copy of the decision to initiate criminal proceedings, although the FSB investigator had told him the charge and even tried to extract a signed undertaking not to divulge any information about the investigation. The wish to keep it secret is unsurprising since Kadyrov is facing criminal charges which carry a mandatory 5-year sentence over a Facebook post from March 29, 2016. In it, he gave a link to a TV ATR broadcast on money being collected for the Crimean Tatar ‘Asker Battalion’. Kadyrov commented on the link, approving such donations and stating that Crimea is part of Ukraine. At present, he is charged ‘only’ with expressing the same view on Crimea’s status as that of the United Nations, all European and international bodies, and all democratic countries. When Russia set to banning the Crimean Tatar Mejlis, or representative assembly, it seemed unclear itself what that entailed. If the now activated ban covers regional Mejlis bodies, then they will find that Kadyrov is also not concealing, or withdrawing, his membership of the Feodosia Mejlis. Russia’s ‘List of Terrorists and Extremists’ contains the names of numerous Ukrainian political prisoners, such as renowned filmmaker Oleg Sentsov, Crimean Tatar human rights activist Emir-Usein Kuku and 18 other Crimean Muslims jailed on unproven charges of involvement in Hizb ut-Tahrir, an organization which is legal in Ukraine. 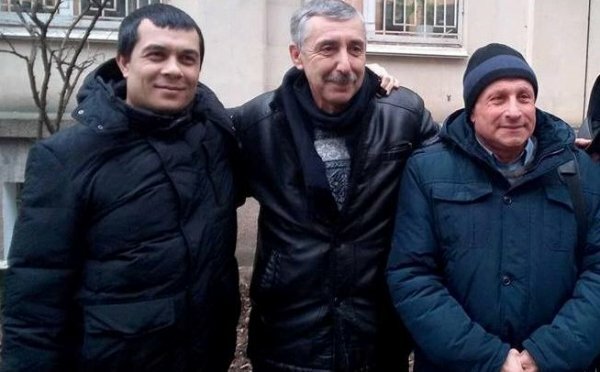 It also includes two other Ukrainians - Crimean Tatar Mejlis leader Ilmi Umerov and journalist Mykola Semena who are also charged under Article 280.1 of the Russian criminal code with ‘public calls to activities aimed at violating Russia’s territorial integrity’. The new norm was introduced in May 2014 and has, as feared, been used widely to prosecute and imprison Ukrainians and Russians in the RF who have criticized Russia’s invasion and annexation of Crimea.